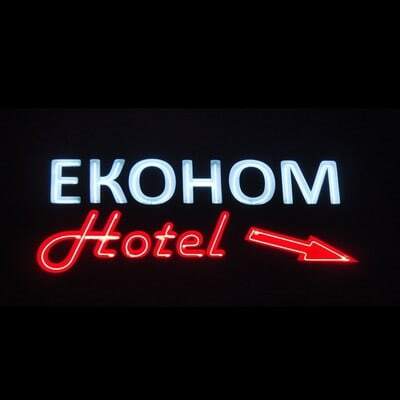 Inexpensive, econom class hotel "Econom" is located in a center Donetsk in the district of the Kritiy rinok. A hotel is specialized on placing of on assignment employees. 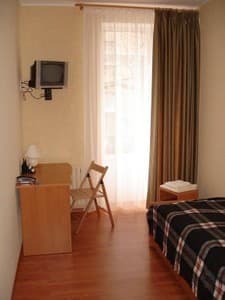 We offer one, two and three-seater rooms of eurostandard at low level price. There is a town telephone, cable TV, refrigerator, conditioner, free Wi - Fi Internet in each room. Cheap price, irreproachable cleanness, high-quality furniture, comfortable and comfort situation of the hotel takes you pleasant impression from a stay in our hotel. 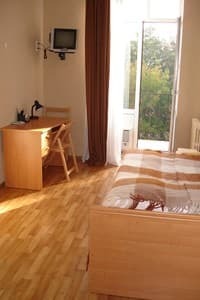 Description of the room: One-room apartment with a double bed. All children under 10 years stay free of charge for cots. The central part of the city Donetsk. Take a taxi bus № 1 from the station «Railways station» to the station «The Central market» and taxi bus № 46-B from the station «Railways station» to the station «The Street 50 years SSSR» or bus № 16 to the station «Kritii Rinok». Take taxi bus number 83 from the Putilovskiy station to the station «The Street 50 years SSSR». Take taxi bus number 77 , 73-B, 42-B from the Yugniy bus station to the station «Kritii Rinok».